One of my topical collections started out as Norse mythology and quickly branched out to Vikings, Viking ships, runestones, and even pre-Viking monuments in northern Europe such as stone circles, dolmens, rock carvings, and so on. This thread is for stamps that fit roughly within that scope. 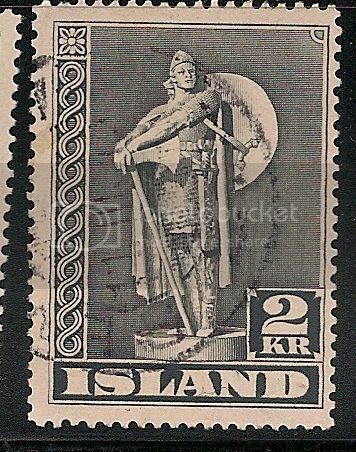 To get things started, here is an Icelandic stamp showing the Viking who first settled Newfoundland, Thorfinn Karlsefni. Oddly enough, the statue it is based on is located in Philadelphia. 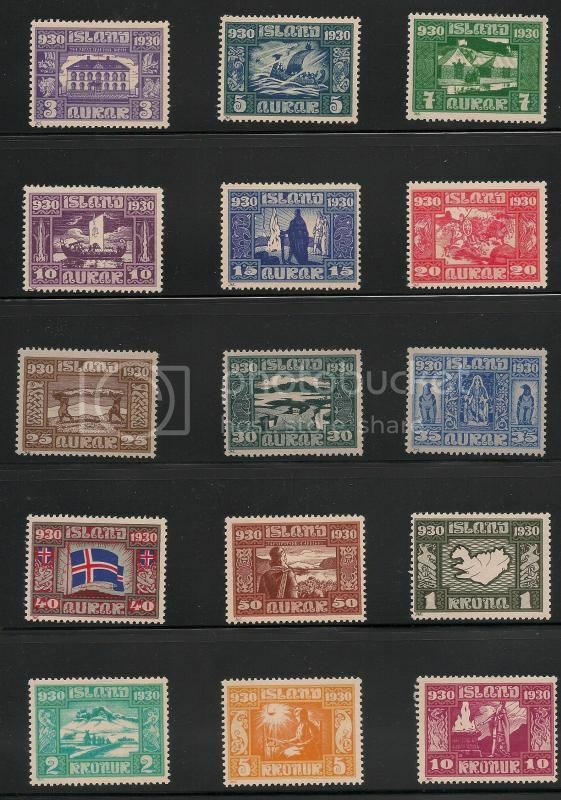 Here is a booklet from Sweden etched by Slania. The statuette in the upper right corner shows Freyr, the fertility god after whom Friday is named. Here is, to my knowledge, a complete collection of the topic of runestones. The one from Denmark, on the left, is the Jelling stone marking Denmark' conversion to Christianity. The one from Sweden is the Rök stone, the longest known Runic inscription. It is in a small village in central Sweden in a region that, according to some legends unconfirmed by scholars, was the source of Goths, and mentions a Theodoric, a local hero who became famous for being the Barbarian who took over Rome and ran it better than the Romans had for several generations. His wife, I understand, was responsible for the mosaics in Ravenna. For the thousandth anniversary of the Althing, Iceland's parliament originally held at a spectacular volcanic crag a couple of hours outside of Rejkjavik (known as "Rinkydink" in some less couth quarters). The last of the stamps depicts a sacrifice to Thor, better known for being the namesake of Thursday and the inspiration for some comic strip. 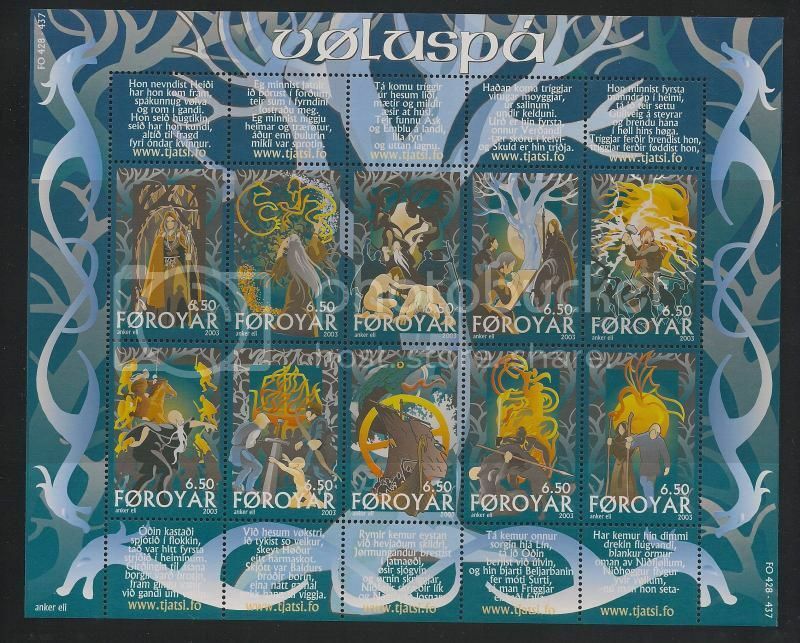 Two more stamps before I head off to celebrate Freyr's day in Philly's more notorious bars. 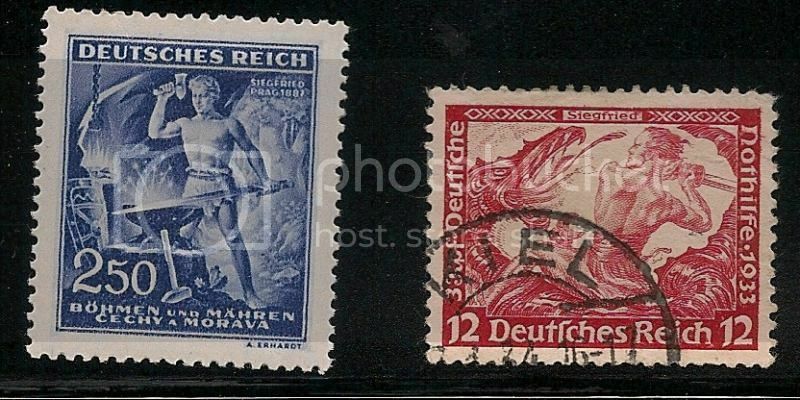 These are from Germany and NSDAP-occupied Bohemia and show Sigfried. Trigger alert: those who have seen the opera may want to fall asleep as it will be several hours before the fat lady sings. greaden, this is a really interesting and well put together thread. Love it! And these stamps just pretty much rock! Very nicely put together and presented here! greaden Many thanks for these great posts! In the last Act of the opera, Siegfried climbs a mountain and wakes the Valkyrie Brunhilde from sleep, passing through a ring of fire. The only time I have seen the opera, Siegfried was sung by a rather short and slim baritone and Brunhilde by a large tall Lancashire soprano. It was done in English and the auditorium burst into giggles when Brunhilde sang about how strong Siegfried was. It didn't help that the baritone had tripped on the way up the diminutive mountain on the stage set. 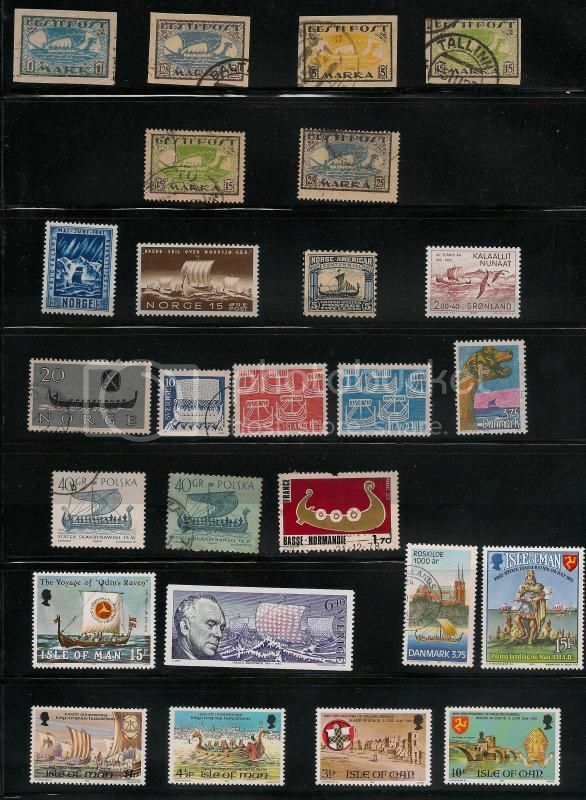 Well thought out subject with great stamps. Thanks for sharing!!!! Here is a sheetlet of Regin the Blacksmith, a character in the legend of Sigurd. 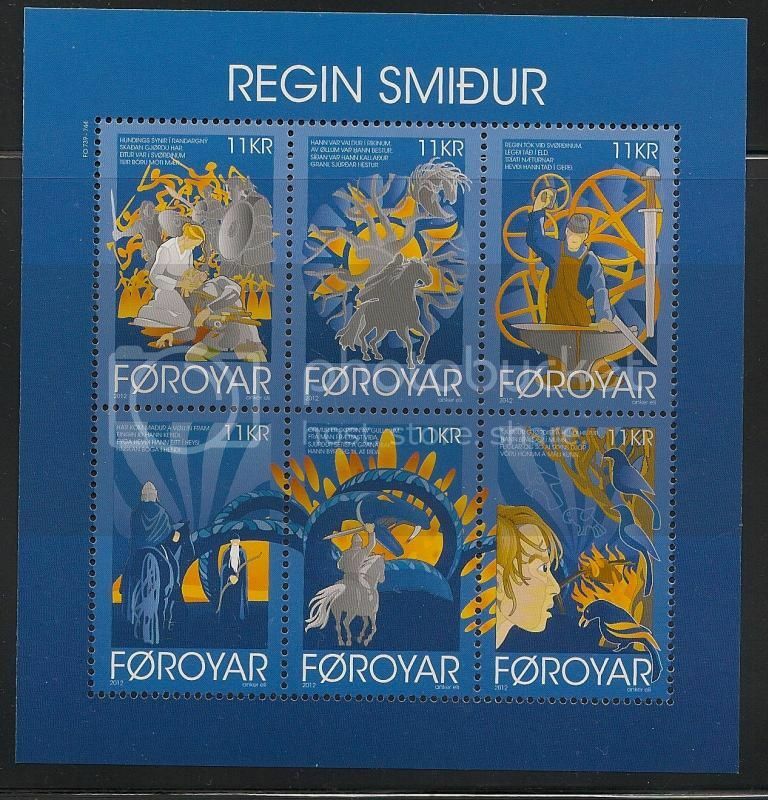 There is a Faroese ballad, Regin Smidhur, about him. Tyr,a Faroese metal band, sings it. The video is easily found on Youtube. Has Britain issued any stamp depicting Lindisfarne? If so, I should seek it out and place it on the opposing page. Who doesn't like Vikings? He he he. I hadn't noticed so many stamps on the subject before. This year Ireland issued a se-tenant pair of stamps commemorating its Viking heritage. The Vikings played a major part in Irish history from the end of the 8th century to the middle of the 12th. They founded Dublin, Waterford, Wexford, Cork and Limerick. 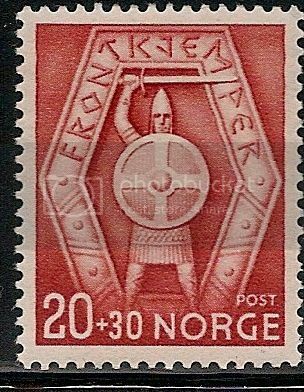 The left-hand stamp shows an ornate Viking brooch; the right-hand, the hilt of a Viking sword. Very nice I like the dragon stamp. The Vikings settled for a time in Greenland until the climate deteriorated. Leif Eiriksson was the son of Eirik the Red, who founded the Greenland settlement. Travelling from Norway to Greenland in about the year 1000, Leif was blown off course and ended up in North America, in a region he called Vinland, which archaeologists generally believe was in Newfoundland. Evidence of Viking settlement has been found there. Subsequently various Viking groups visited Vinland. There are conflicting accounts in Icelandic sagas of what happened, but the settlement in Vinland did not last long. According to one tradition, there was fighting between different groups of Vikings, with all the Icelandic Vikings killed; according to another, there were disagreements following hostility from some of the indigenous people, and the Vikings abandoned Vinland as a result. Either way, a lot of Vikings died there. It is likely that later generations of Vikings visited North America to gather timber (of which there was an acute shortage in Iceland and Greenland) and to trade. You can read all about Leif's adventure in two sagas - The Saga of the Greenlanders and The Saga of Eirik the Red - and these sagas should be compulsory reading for anyone interested in the early history of Europeans in North America. We do not know how or where Leif died, but probably it was in Greenland. 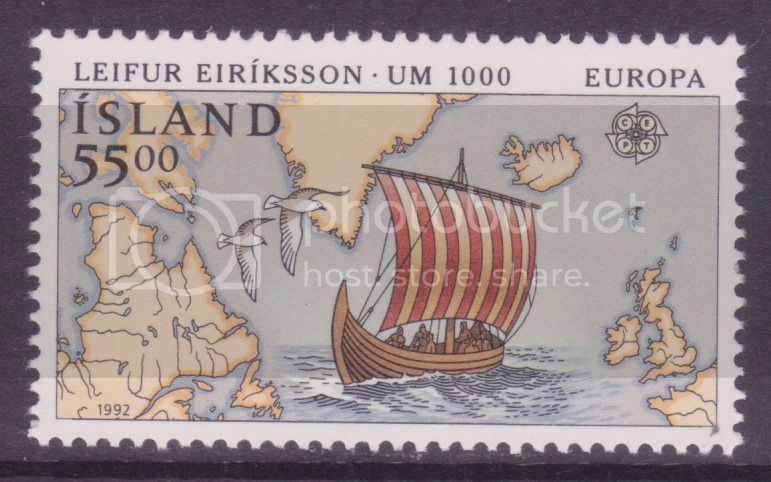 In 1992 - the 500th anniversary of the first voyage of Columbus - Iceland issued two stamps for the occasion, one of which features Leif - SG 785 - with an out-of-scale map showing most of the North Atlantic, including Newfoundland, and a Viking ship. A 1977 British local post issue from the Summer Isles (off NW Scotland) showing a Viking longship. It is part of a set for the silver jubilee of Queen Elizabeth II. Another British local stamp from the Summer Isles showing a Viking longship. The Vikings and Norwegians ruled this part of Scotland for several centuries.